The lean MiyoLinux is aimed at System V lovers who aren't afraid to customize. The Linux world is home to several lean distros that are intentionally designed to be lightweight and easy on system resources. Most of these systems avoid the bloat of KDE or Gnome, opting for a lighter and simpler desktop. They typically offer a scaled-down lineup of user applications, with the philosophy that, if you really want something else, you can always install it. The primary use case for these lean distros is to run on old hardware, fulfilling Linux's role as the system that still runs on legacy computers. On the other hand, some users on conventional systems simply prefer a lean distro, because they don't like bloat. They find that a smaller footprint makes the system more responsive and easier to use. Many lean systems are based on the universal Linux uber-distro known as Debian. The stable and well-tested Debian Linux is also the foundation for other Linux systems, including Ubuntu and Knoppix. A huge controversy erupted in the Debian community over systemd, which became the default initialization daemon in Debian systems starting in 2015. Many of the Debian faithful objected to systemd, which they considered too complex and inconsistent with the Unix principle of simplicity. A group of developers eventually forked Debian to found the Devuan project  and develop a Debian-like distribution that retains the System V init and its surrounding components. If you like Debian but prefer System V, you can use Devuan instead, but what if you want to use a lean distro based on Debian? Is there an answer for the Devuan/System V crowd? The answer is yes. If you're looking for a scaled-down Linux based on Devuan and System V, you'll be happy discover MiyoLinux . Miyo is an acronym for "Make It Your Own," which underscores the philosophy of starting with a bare-bones system and customizing it to fit your needs. MiyoLinux uses the Openbox  window manager, which has been under development for more than 15 years and is considered extremely lightweight and frugal. Although Devuan uses the DEB package format, it cannot offer the enormous software pool available through Debian. However, if you really want to access the full range of applications available through Debian, you probably don't want a system like MiyoLinux anyway. The whole point of MiyoLinux is to let you be selective. The MiyoLinux ISO image for 32- or 64-bit hardware is about 600MB – not as small as truly tiny distros like Damn Small Linux, but significantly smaller than the latest generation of mainstream flavors (the latest Ubuntu weighs in at 1.8GB). MiyoLinux opens a simple GRUB screen, which offers the option of copying the entire operating system into RAM and using it from there. This is particularly recommended for older computers or for starting from a slow optical data medium. After a quick start, MiyoLinux welcomes you with a simple desktop (Figure 1). It only shows two icons for calling instruction files and a starter for the installation. A tint2 panel is at the bottom of the screen. A welcome window introduces you to the system. 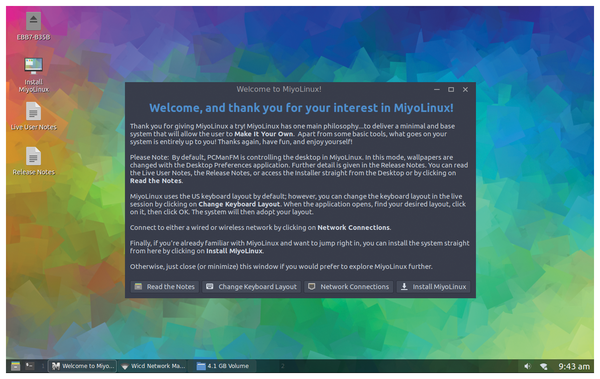 Figure 1: MiyoLinux starts in next to no time showing a simple desktop with a panel and welcome window. Unlike most other distributions, MiyoLinux does not have a conventional menu button in the panel bar; instead, it has a starter for the PCManFM file manager. In the slim Devuan derivative, it not only acts as a file manager, but also – represented by the Applications menu – as a program launcher. Various subfolders of the Applications menu let you access the few integrated applications. These tools include htop, BleachBit, and GParted, as well as the small text editor Leaflet. A web browser is missing, as are other ubiquitous heavyweights like LibreOffice, Thunderbird, VLC, and Gimp. On initial startup, MiyoLinux uses miyo as the default username, password, and root password. The welcome screen lets you customize the system using the Change Keyboard Layout and Network Connections buttons. 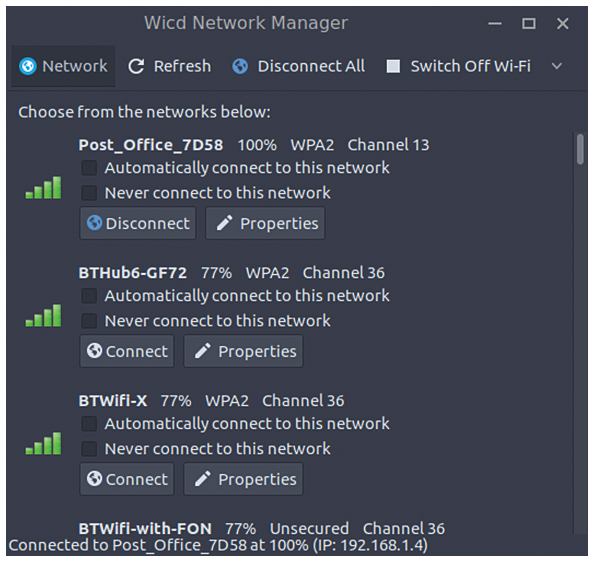 If you are not connected to the network via a wired DSL connection, the Wicd wireless manager enables network access. One positive aspect is that MiyoLinux integrates proprietary firmware files for common wireless components; wireless Internet access thus works immediately (Figure 2). Figure 2: Thanks to Wicd, you can set up your wireless connection with just a few mouse clicks. Use the Install MiyoLinux starter on the desktop or the button of the same name in the welcome window to open the graphical installation wizard and install the operating system on the hard disk. The Refracta  installation wizard largely dispenses with graphics gimmicks and requires much more work from the user than, for example, Ubiquity or YaST, but it gets to the point very quickly. 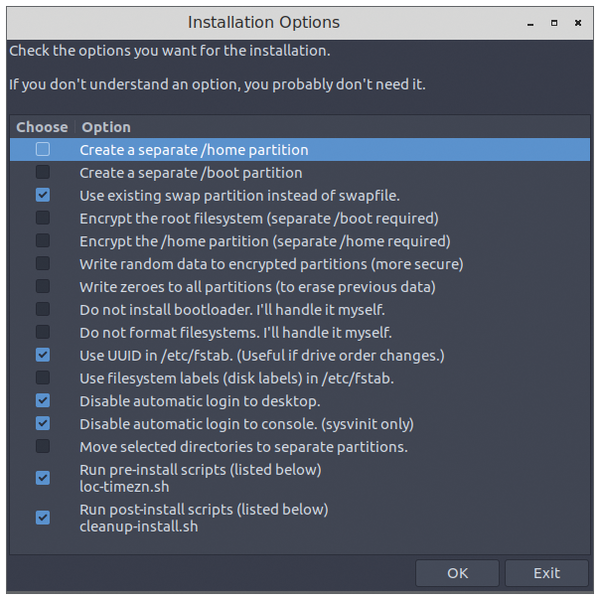 For partitioning, it uses either GParted or cfdisk. In a small options dialog, you can also adjust certain configurations that differ from the default settings by setting or removing a checkmark (Figure 3). If you have already configured Internet access in live operation and entered some programs into the system using the integrated Synaptic package manager, the setup wizard takes over these applications. This saves you from having to reinstall the software later. The Synaptic package manager lists about 51,800 packages, or about 10 percent less than Debian. Figure 3: With Refracta, you can install MiyoLinux on your mass storage. Even after installation, the application folders only contain the tools you need to assemble an individual system. MiyoLinux also borrows from other desktop environments: The Xfce power manager, for example, is a program for controlling the system's energy consumption that significantly increases the battery life of mobile computers, given suitable settings. MiyoLinux also has the Gufw graphical tool for configuring the firewall from Ubuntu's software pool. You are not limited to Gtk applications: From Synaptic, applications can be installed from any desktop environment, including KDE Plasma; the package manager automatically resolves all the dependencies. MiyoLinux then adds appropriate starters to the Applications directory subfolders, which you need to call individually in PCManFM. By default, MiyoLinux speaks English in all dialogs. If you would like to use another language, say German, you need to set up the packages task-german and task-german-desktop in Synaptic. Here, Synaptic pulls a total of 59 packages and occupies about 390MB of additional space on mass storage. In doing so, LibreOffice also gets onto the hard disk after all, with German help and menu navigation. Even with other large standard programs, such as Firefox, you have to learn about the appropriate localization files that Synaptic lists separately. Localization, especially of the configuration tools, is not complete – which is unsurprising for a still quite recent project like MiyoLinux – and should improve in the course of time for users who prefer a different language setup. In 2014, the Debian project decided to replace the old init system with systemd, but a small group of developers resisted, forking Debian to start the systemd-free Devuan. We decided to take a look at Devuan 1.0.0, the first stable release. Semplice is a fast and simple desktop system that avoids the clunky, stripped-down look associated with many "lean" Linux distros. Legendary Uber-distro splits over the systemd controversy. The world is left to wonder if the recent news of a Debian fork is an important event or a minor historical footnote. Either way, it seems like a good story, reminiscent of the Linux stories of the past, when the community really looked and behaved like a collection of individuals rather than a corporate fan club.